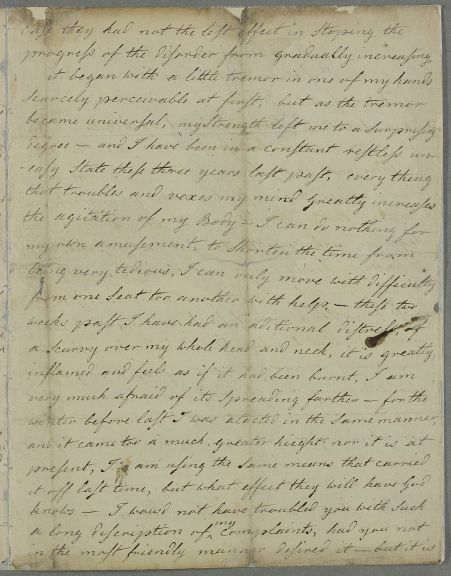 Letter from an unnamed correspondent to an unspecified (female) recipient, mentioning the health of Mrs Arnot and Mrs Paterson, and giving details of the correspondent's own case. The writer suffers form a gradual feebleness and tremors, accompanied by a skin condition. 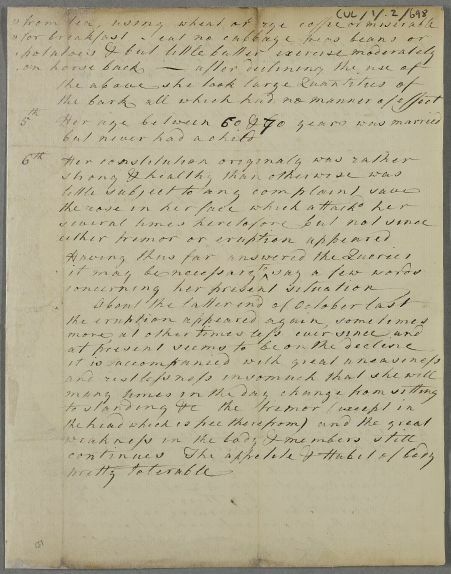 Letter is attached by repair to another document, a list of answers to Cullen's queries about an unnamed female patient, probably the same woman, as the symptoms are identical. 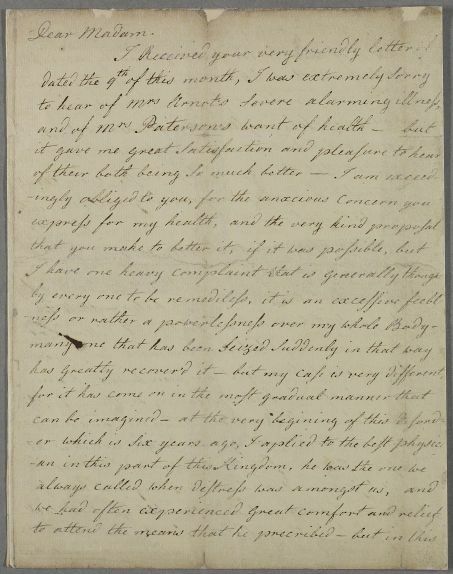 Summary Letter from an unnamed correspondent to an unspecified (female) recipient, mentioning the health of Mrs Arnot and Mrs Paterson, and giving details of the correspondent's own case. The writer suffers form a gradual feebleness and tremors, accompanied by a skin condition. 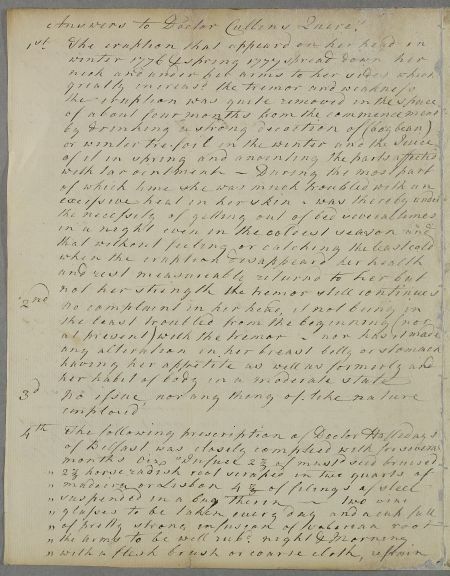 Letter is attached by repair to another document, a list of answers to Cullen's queries about an unnamed female patient, probably the same woman, as the symptoms are identical. Case of Mrs Arnot of Conuchy, who is aged 80 and has a sudden illness. Case of Mrs Paterson whose shortness of breath, swollen legs and thirst are all taken as signs of dropsy. She later develops a 'nervous stomach'. Case of an unnamed female patient who has suffered a gradual 'feebleness' over her whole body, with tremors and accompanied by a skin condition. Answers to Doctor Cullens Queres. 1: Colloquial term for 'very weak tea'. Considerably predates the earliest usage cited in OED, which is in a novel of 1842.